MultiBrief: Toronto’s rubber duck: Waste of money or clever tourist attraction? Toronto’s rubber duck: Waste of money or clever tourist attraction? Canada 150 celebrations recently kicked off with the arrival of the world's largest rubber duck floating ashore at Toronto's harbourfront. 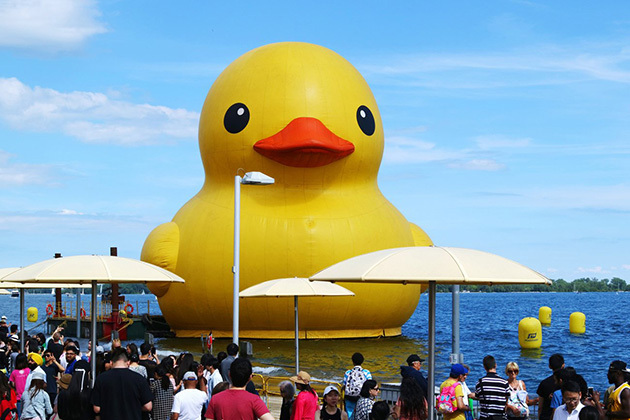 As the guest of honour for the Redpath Waterfront Festival, the rubber duck was a point of contention, costing taxpayers $120,000 for its appearance and tour along the waterways of Ontario. However, as the Canada Day long weekend took place, the duck drew hundreds of thousands of visitors to the harbourfront to snap a picture — ultimately benefiting nearby restaurants and hospitality providers. The rubber duck was quite a high-maintenance visitor. Metro News reported that the facsimile of a project by Dutch artist Florentijn Hofman was the height of a six-story building, and weighed in at 30,000 pounds. It took 2.5 hours to inflate, and required a team of 10 individuals to keep it afloat over three days. Because taxpayer dollars were involved in financing this novelty attraction, there was backlash from locals. From complaints about the cost to how the money could have funded something worthwhile, such as the ongoing transit projects, to the fact that a rubber duck has never been associated with being a "Canadian figure," people were not happy. The Toronto Star quoted Conservative MPP Rick Nicholls as saying, "I am not against people enjoying Canada Day festivals and festivities, but what I object to is the government funding a giant rubber duck that has no connection to Ontario or Canada 150." Several people interviewed and those on social media stated that if anything, a giant inflatable beaver should have come to town. Christine Van Geyn, director of the Canadian Taxpayers Federation, reinforced Nicholls' opinion, stating that the duck was unnecessary, as people would be visiting the harbourfront anyways, should they be attending the Redpath Waterfront Festival. It is worth wondering, however, whether the duck was a draw for those looking to share a picture on social media. Sure enough, hundreds of thousands of people flocked to the Toronto Harbour over the long weekend to snap selfies and see the giant rubber duck in person. In a recent follow-up piece, blogTO noted that credit and debit card payments were up 17 percent in the area that weekend, compared to last year. For a holiday weekend often suited to getting out of town to go to the cottage, or staying home to enjoy a backyard BBQ, the duck's arrival presented an alternative and unique activity that ultimately benefited nearby businesses. As the duck was deflated on July 3, it wasn't a final goodbye. This summer, the duck will be visiting several waterfront cities hosting their own events throughout Ontario. Events featuring local First Nations and Métis artists, musicians, performers, ribfests, children's programming, canoe and kayak races, and much more will be taking place, celebrating Canada's culture. Despite the grumblings about the cost of the rubber duck, the successful turnout at the Toronto Harbour presented a glimpse of what's to come and creates hype for future tour dates, even if it's just for guests to stop by and take a selfie. Undoubtedly, social media sharing has made the world's largest rubber duck a popular figure. Festival and events marketers may seek to include attractions like these in the years to come (preferably at no cost to taxpayers, if possible). A past similar attraction — the light-up Toronto sign that was heavily Instagrammed at Nathan Phillips Square for the 2015 Pan Am Games — has since become a permanent attraction for tourists and locals. Who knows? Perhaps the rubber duck will set sail on many aquatic tours in the years to come.